This book explores the organic motif found throughout the writings of the Dutch Calvinist theologian Herman Bavinck (1854-1921). Noting that Bavinck uses this motif at key points in the most important loci of theology; Christology, general and special revelation, ecclesiology and so forth; it seems that one cannot read him carefully without particular attention to his motif of choice: the organic. By examining the sense in which Bavinck views all of reality as a beautiful balance of unity-in-diversity, James Eglinton draws the reader to Bavinck's constant concern for the doctrine of God as Trinity. If God is the Father, the Son and the Holy Spirit, Bavinck argues, the creation must be more akin to an organism than a machine. Trinity and organism are thus closely linked concepts. Eglinton critiques and rejects the 'two Bavincks' (one orthodox and the other modern) hermeneutic so commonplace in discussions of Bavinck's theology. Instead, this book argues for a reunited Herman Bavinck as a figure committed to the participation of historic orthodox theology in the modern world. 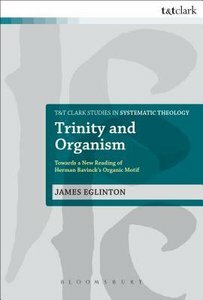 About "Trinity and Organism (T&t Clark Studies In Systematic Theology Series)"